As a Godzilla fan it always pains me to see Netflix churning these films out. The first one wasn’t bad but it did have a lot of red flags. The sequel didn’t do much to help calm my fears and this one ended the trilogy out on a low note. Godzilla is one of the most influential characters in all of media so you just don’t want to see him disrespected like that. There might be a good thing or two to be found here, but you’ll have to make it past the rest of this film to enjoy it. The film starts off where the last one ended. Godzilla beat the Mecha Godzilla city and is now taking a nap. Humanity has given up once more and must now hope that Ghidorah can defeat him. Metphies has convinced them that Ghidorah can do this, but they will all have to offer up their lives to summon him. Meanwhile, Haruo wants to stop Metphies but he is busy dealing with his own insecurities and lack of will power. Can he help save Godzilla from this threat or is everyone going to die together? The classic plot of someone having to save Godzilla is never a good idea. I like to see Godzilla as a very powerful Kaiju who does the saving if necessary. He isn’t a hostage to be rescued or a supporting character in need of the lead. He’s the King of the Kaiju, but doesn’t get to look very good here. For the first half of the film he barely appears. Then when he finally does, he can’t even land a hit on Ghidorah. He gets lolstomped the entire time until Haruo is able to make Ghidorah manifest himself and Godzilla throws in some blasts. Godzilla was devoid of character in this version. At least in older films you could tell that he knew what he was doing. In this trilogy he is really just along for the ride. Ghidorah wasn’t all that good either. At least he actually appeared unlike Mecha Godzilla, but he never assumes his true design. It’s more like 3 giant dragons showing up to fight instead of the 3 Headed beast we’ve always known. He doesn’t have any real character or personality either, but at least it was fun hearing his iconic roar. The scene where he destroys everyone was definitely pretty intense and reminds you that he is a force to be reckoned with. Before I get into the other characters lets talk about some of the ways this film failed. The first of which is the terrible lack of budget. It’s not really a good excuse to be honest as many films have surpassed such limitations. Still, it is very noticeable here how Godzilla can barely move. His character model appears to be too huge for the animators to know what to do with him. All of the characters are pretty choppy. As I’ve mentioned in the past, this looks more like a Fire Emblem 3DS title than an actual movie. It works for the game because of its style and directing, but Godzilla has none of that. Even with better animation the film would have still failed but it would have done a whole lot better to be honest. For the soundtrack it’s not as harsh. The film has some reasonable themes like the one in the second film for the aerial scenes. Still, for the most part it’s all just a lot of emotional themes that you can’t connect with. There are some good emotional themes of course and Tsubasa/Naruto tend to claim the best of that genre, but these don’t have that level of heart. The music is just good enough to be considered the film’s highlight though. At least you have something nice to listen to. Most of the film tries to tackle some fairly deep themes, but does so with such a heavy handed approach that it completely fails. Metphies has been trying to tell Haruo that the only way to beat a monster like Godzilla is to become one. That seems to be obviously fake from the get go so you’re waiting for Haruo to ask the tough questions. The problem is that he never does and just listens for a while. Metphies’ ramblings go on for a very long time and seem to take up most of the film. He’s not actually saying much. It’s a very short message that he continues to convey with different phrasings but ultimately the message is intact. This tells me that the writers just wanted him to seem really smart, but couldn’t get that across. He’s a decent manipulator, but you also have to take into account the fact that the crew was full of suckers. Metphies is a solid villain, but one who is given too much credit in universe. The characters could have just shot or stabbed him and they could have saved themselves an extra 2 hours. Of course it wouldn’t matter much in the end since Godzilla would still rule the world, but at least they wouldn’t have to deal with 2 kaiju. I do have to say that it was a little too sudden with how the humans were rooting for Godzilla though. Even without Metphies and his plans, they quickly fell into another civil war. They did prove the point about how the Earthlings will always be getting into wars and fights. Having humans’ cosmic purpose be to bring about the Kaiju would certainly be an interesting twist. I definitely didn’t like the main commander since he wouldn’t do anything. He never made any decisions before dying. His 2nd in command was a lot more decisive with how he would react to the situation. Of course, this plot would ultimately never go anywhere which is probably the point, but it still makes you shake your head. Then you get to the ending of the film which is utterly terrible. So, Haruo may not be the best character around, but at least for the most part he is very determined and always eager to win right? Well, after taking down the main villain he quickly starts mourning and apologizing? Why? I can understand him regretting this path forcing him to take a life, but he shouldn’t actually feel sorry for the character. The guy he took down was evil from the start and had been for centuries. He just murdered nearly the entirety of the human race that had survived. There shouldn’t be any sympathy for this guy. Then Haruo makes an even worse decision to pilot a machine towards the end for a suicide run. Such a mission accomplishes nothing and he was basically ditching his family for this. If he was by himself then it could work although it would still be a terrible decision, but if he knew that he would do this then he shouldn’t have started any bonds in the first place. As it is, the romance in the film was pretty terrible. The scenes with the Mothra twins are painful and feel unnecessary. I also don’t like how one of them went down without a fight. She was shown to be a fairly capable hunter and has telepathy right? Surely she could have at least done something by this point. While the film isn’t violent, it does get fairly dark with all of this. Between the suicides and such, Haruo also has murderous dreams with people becoming food. We also see an army get eaten by a dragon, but since it was ethereal they just turned into glowing remains which was a very tame way to handle the whole thing. The film never really has any happy scenes. Whatever we do get always tends to have a twist. Take the twist ending of the film. It completely makes the whole adventure pointless and the same goes for Haruo’s sacrifice. The people just found the next thing to worship and that was the end of that. Why couldn’t the people have at least been a little likable? I think the main reason you can blame for this film failing is that it tried to be a lot deeper than it actually was. The movie tried to be very sophisticated and complex, but it just doesn’t work. You need excellent writing to do so which this film does not have. The plot isn’t interesting enough to start with. A good survival story on a foreign planet can work well and the film set things up with a lot of potential in the first film. It just managed to squander basically all of it. Again, I think we can blame some of this on the budget as well. Overall, I didn’t talk about Godzilla much, but there’s a good reason for that. He doesn’t really get to appear in this film. His scenes are very short and in those he functions more as an object than as an actual creature. This trilogy really managed to fall flat on itself but the good news is that I doubt we will get another Godzilla film weaker than this one. It’s just almost impossible to fathom. If you already saw the first two Netflix titles then I suppose you should check this one out. Otherwise, I’d advise you to steer clear of the trilogy entirely. It will just waste your time by the end. It’s time to look at a game I’ve had my eye on for quite a while. The cover and screenshots looked pretty good and it has a 3D multiplayer option. You can’t really beat that. Alas, there’s a reason why this game isn’t getting the critical acclaim that you might expect. The reason is that the game is quite limited in content and won’t last for very long. At full price this would be quite dicey. The basic plot is that you are fighting off an alien invasion. 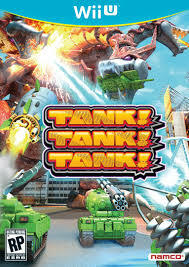 We don’t know why all of these Kaiju and robots are attacking but it’s up to you and your tanks to fight them back. Show these guys that Earth is not on the menu. Defeat is not an option so fortunately you will have quite a few tanks to choose from by the end. The story is also co-op enabled or you can have an A.I. jump in. The basic gameplay is probably just as you would have imagined it to be. You control the tank and drive around 3D environments as you take it to the monsters. You have your main weapon and you can also grab 2 other temporary ones during the level from enemies you defeat. You will naturally be driving around during this as well to try and dodge as many shots as possible but be warned that some tanks have a very hard time moving. Sometimes it’s best to just find a good spot and hold your ground. It definitely looks and feels like the arcade game that it is which adds a nostalgic twist to the title. The gameplay may not be quite as smooth as you would like but it feels natural. The graphics are nice and bright with colorful designs for the monsters and the levels. It all looks pretty solid even if not groundbreaking. It’s a game that is very nice to look at visually. The soundtrack is less impressive as the game has a very small amount of tunes which keep on looping. The tunes aren’t bad but more of a selection would have been good. You can only hear the same tune so many times before it loses some impact. Now lets talk about what hurt the game quite a bit. It’s the fact that the title really tries to artificially extend its length. There are around 35 levels in the game but at first you can only play around 8. How do you unlock the next batch? You have to beat all of the levels again with a different tank. The game runs on a star system. You get 1 star every time you beat a level. To complete the game you need dozens and dozens of stars so you have to complete each of the levels over and over again. It’s done to a very tedious degree. I understand that the game wants you to play it a little extra, but you can’t lock the main story behind such a thing. What that shows is that the developers were nervous and thought people wouldn’t willingly replay the levels purely for the tanks. They have to trust in their game or put some good unlockables in. I played their game for a while and did the replays, but when I saw that I had to replay the 20 levels again deep into the game I just put it down. There’s just no way I was going to do that many levels just to play a few more reskins. Yes, towards the end of the game you started fighting the same bosses and opponents over and over again. The stage limit is limited and same with the character models. As a result you can tell that this should be a short game. It just didn’t have the production values to be extended so much by just reusing the levels. The game could have been clever with shifting the levels or the goals a bit to make it more unique, but didn’t do any of that. So, Tank Tank Tank is a fun game, but it is stretched out to the point where it loses some brownie points with you. It does have a good amount of replay value though I suppose. Beating all of the levels with all of the tanks will take quite a while. Each level is fairly short at only 1-2 minutes, but beating it over and over again just isn’t the most enjoyable experience. You also have to take into account the short cutscenes that play before each level which cannot be skipped. They’re short, but it’s the little things like this which hurt a bit. Fortunately the game does have a multiplayer option which is where most of the real replay value will come in. Now that’s a mode where you can play for a long time without getting bored. Overall, I would still recommend this game. It goes for bargain prices nowadays so that will help with the lack of content issue. It’s a good low price option for getting in some multiplayer fun. You also have to give it some credit for the cool monster designs. The whole thing feels like a big Kaiju homage at times. You have characters like Ghidorah and King Kong running around and again, the core gameplay is fun. That’s still the most important part of any game and this one nails down that part so you’re still going to have fun. It’s best in short batches and if you follow that you’ll be entertained for quite a while. It’s time to look at one of the older Godzilla movies. This one brought Godzilla back in his most fearsome film yet. It’s easy to see why this new series of Godzilla movies really took off. People liked the originals quite a lot of course, but I think the world was ready for a more serious incarnation of the character. Personally I preferred the cheesier days, but I like the newer films as well. This one is fairly good, but still makes you end up missing having some other giant monsters for Godzilla to deal with. Just having the Big G on his own is not quite as exciting. The film starts with someone wandering onto a boat and seeing that the whole crew has been murdered. A giant sea creature is responsible, but everyone decides to pin the blame on Godzilla instead. Honestly the big Kaiju was innocent this time around, but Godzilla decides to destroy all of Japan just to clear his name. Japan seems doomed, but that’s when America steps in. They decide that they’ll end the threat of Godzilla once and for all and prove that modern weaponry actually can make a difference in this fight. I have to admit that the beginning was a lot more atmospheric than I expected it would be. The scene of the guy walking through the ship and encountering the alien like species was intense. It was like something out of a horror film. The scene was a little on the violent side with the corpses though. I think they could have been more subtle with the effects which would also work better with the horror vibe. This subplot never really amounted to much in the dub version either. You would barely even know it was concluded. Apparently it seems like the subplot was still wrapped up according to Wikipedia, but it was shortened to the point where it really just felt like filler. On the positive side, it is always nice to see Godzilla. He appears for a reasonable amount of time here. It is unfortunate that he is more of a mindless monster here than the cunning Kaiju that we see him to be in other films. It really depends on the movie, but sometimes Godzilla is just a monster who is out for destruction and other times he actually has a will of his own. This movie seemed to be the former although he certainly made the most of it. This Godzilla was happy to crush anyone he could find and even his facial expression seemed a lot meaner than usual. His face was frozen in a glare throughout the entire movie. This was very clearly not a Kaiju that you could mess with. For the human characters, I guess they were okay. They didn’t have a whole lot of personality, but ultimately were trying to do the right thing. The main character wasn’t particularly good at his job as he tends to talk aloud and spill government secrets. I can only assume that he will improve from here on out though. The heroine doesn’t really do much besides bring papers to the main characters and such while the old professor is busy telling everyone that you can’t beat Godzilla. As the Kaiju was ultimately defeated with ease he ended up looking bad. The Cold War battles between the U.S. and Russia were pretty interesting here. It was nice to see us shoot their missile out of the sky and save the world. The U.S. ultimately did the most to save the world in this film. Not only did they save Japan from Russia but they also stopped Godzilla by pressuring him into the Volcano. I think it’s safe to say that they were the MVP here and that’s why it’s fun to have them around. There are many Godzilla films where you wonder how much quicker it would have finished if America had stepped up to the plate. Well…not we know. On that note, I do have another issue with the climax. As mentioned, in this film they portray Godzilla as a mindless monster which allows the heroes to trick him. They play some bird sounds and throw it in the Volcano so Godzilla peers over and then they push him in with controlled explosions. That’s really not a very satisfying way to end that plot and I don’t think Godzilla should have gone down like that. He’s the King of the Monsters! A quick fall into a volcano shouldn’t do much and I don’t think he should have been lured to the edge so easily either. It was a bit iffy, but I guess they had to end the film somehow. The special effects are pretty decent. The city shots have improved quite a bit compared to the Showa days. The actual suit seems to be about the same but the laser blasts are certainly more colorful. It looks like a strobe light show by the end as explosions of all colors start popping up as Godzilla torches the city. At one point the whole city appears to be in flames which was a nice touch as well. While the soundtrack is less noticeable, I did like the Godzilla roars as always. There is one comic relief character who decides to rob some restaurants while Godzilla is nearby. Honestly it’s not a bad plan if you’re a villain since everyone evacuated so you’ve got the city to yourself. The problem for this guy is that he’s drunk so everything takes him forever and ultimately he ends up just getting stomped like everyone else. I do think the main characters did seem to surprisingly not care about the guy at all, but at that point all they could think of was surviving. Overall, Godzilla 1985 isn’t a bad reboot. I think it was an unnecessary one though and the films should have just kept going from the Showa series. Ultimately this era would pick up steam as the monsters were introduced, but it was a bit of a rocky start. 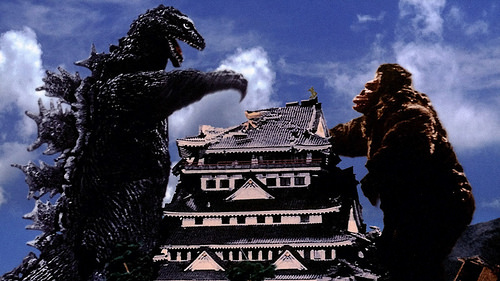 It’s a controversial opinion, but I believe Godzilla films are always best when there is another monster for Godzilla to face. When it’s just him then there isn’t as much tension or excitement since it’s not as if the government can do much against him. (Well…they win sometimes, but it’s still not as exciting) Still, the writing was on point and the pacing was good. This film is still worth a watch and if you can’t take Godzilla seriously then you should certainly watch this movie. It’s probably one of the darkest Godzilla films even if you might find it a little hard to take the movie too seriously with the voices. For the record, I enjoy the dubbing, it’s always pretty fun. It’s time to look at one of the original giant monster films. Many believe that Godzilla is really what kicked off the Kaiju boom, but you have to consider the mass market appeal that Rodan brought with him. Rodan isn’t your average giant monster, he is one that can fly. In fact, if we took this version of Rodan unnerfed and put him up against the other giant monsters, he would crush them. Not even Godzilla would last long against such a threat. Rodan helped audiences finally take giant monsters seriously and still works very well as both a thriller and a Kaiju film. While the film does drop off quite a bit at the end, it’s not enough to negate the rest of the experience. The film starts off with a group of miners heading to the caves. Unfortunately they are brutally murdered by a bunch of giant worms. The humans go for backup but none of their guns are all that effective. Fortunately that’s when Rodan shows up to eat all of the worms and claim dominion over the skies. Any jets that stay in the air are promptly destroyed. The humans realize that the only way to stop Rodan is to throw him into the volcano, but this task gets a little more dangerous once there are 2 Rodans on the field. What can they possibly do? The short answer is nothing. There’s no way that the ending even could happen. What the film should have done was have the humans acknowledge that they can’t hope to stop Rodan. This would have been the signal for a very emotional scene to start as the humans team up to create a giant paper mache version of Rodan that they sail off to an uninhabited island. The Rodans would follow it and leave humanity alone for a little while. Even I may have teared up a little bit at such a spectacle. As it stands, the ending is emotional but in a sad way. I was rooting for Rodan the whole time and was looking forward to seeing him wipe out humanity. For that not to happen is simply tragic. Enough dwelling on the ending though. I didn’t like it, but it wasn’t quite horrible enough to drag the film down too much. I have to give credit to the special effects here as they were handled a lot better than expected. I dare say that it even beats most of the modern films when it comes to depicting Rodan’s speed. In this version you actually can believe that he flies at super sonic speeds since we see him outmaneuvering a jet. Rodan may not have a fancy laser to shoot out, but with moves like that he doesn’t even need one! I also liked the size difference between Rodan and the worms. Since we already saw how massive the worms looked to the humans, it’s clear that Rodan is a colossal beast. As for the humans…there’s not much to say about them. They’re around of course, but they don’t really contribute much to the story. The dub has fun with them as everyone gets in a few good one liners. It’s hard to tell if you’re supposed to take the characters seriously or not. On one hand, it’s not as if they’re making obviously bad decisions or anything like that, but on the other hand…they just don’t seem as invested into the situation as you would possibly expect. After all, having a giant monster around destroying everything is kind of a big deal right? I didn’t dislike the humans, but as with most of the old monster films I found them to be a tad forgettable. Granted, it’s probably because I’m focused on the monsters. I will say that the writing was solid. These films definitely take place back in an era where scripts were actually handled with care and you didn’t have to cringe at every other line. The pacing of the film is good as well and it manages to cover quite a lot in a short amount of time. There’s not much that the film could have done to be much better in these areas as it was just solid. I can only imagine how impressive this movie must have looked back in the 50s. Whether you are currently a big Kaiju fan or just getting into the genre, this is a movie that I can definitely recommend checking out purely on a technical level in addition to being a monster film. 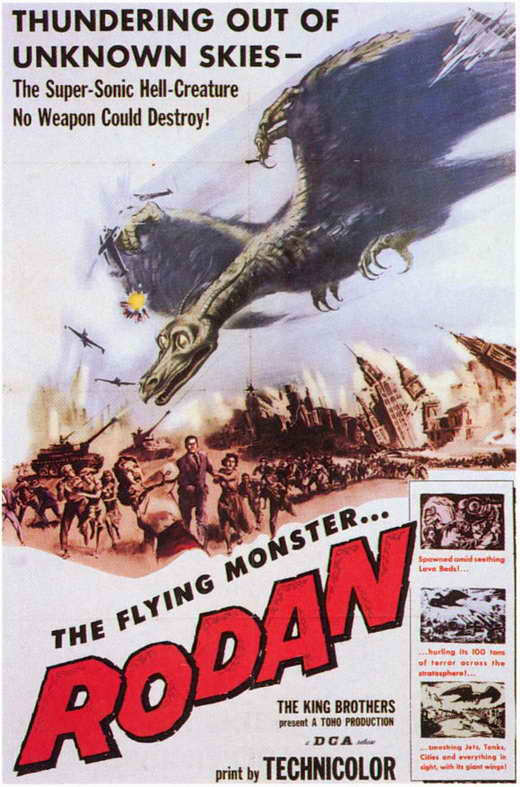 Overall, Rodan is a fun film. He’s always been a solid monster, but one who is probably a little over matched against the others. He’s simply too fast and strong so he tends to get nerfed quite heavily. I’m hoping that the upcoming American film has a good idea of how to use him, but I am going to be entering that film with a few reservations on the power levels department. No worries, it’s still going to be film of the year, but with all of these Kaiju running around I hope that corporate knows what they are doing. Still…when do they not? It’s time to look at an old Kaiju film that not too many people know about. However, once you see the title you know that this is a film to check out. The monsters are huge which is really what you are looking for at the end of the day. It’s a pretty fun film that may start to lose a little steam as it goes on but manages to be a solid product through and through. Naturally you will be rooting for the monsters of course. The film starts off with a reporter being mocked for claiming that our satellites aren’t making it into space and are being shot down. He is determined to prove that he isn’t wrong and is given the chance when a lady shows up and asks him to take photos of an island where she is building a resort. His pride won’t let him do such a thing at first but then another guy shows up and explains that giant monsters may have been seen in the area. The lead quickly realizes that it is all linked and jumps into action. Is he in over his head? One thing you will enjoy right away is the writing for this film. It’s one of those old school scripts where the characters are all having a lot of run right off the bat. Sure, maybe they should be taking this whole thing a little more seriously to be honest, but at the end of the day you have to appreciate the fact that they can still make one liners. The voice acting is on point and the characters are reasonably likable. Kudo may have a little too much pride as he initially doesn’t want to take pictures of landscapes even when paid, but I guess that’s just not his thing. He is quick to jump into action when necessary on the island. We also have the corporate spy who comes in to try and get rich, but things don’t go too well for him. From that point on you already knew he was doomed though. We also have the main heroine who tries to help one of the heroes get away from the mind control that he is under with her yells. I suppose it is fairly effective. You’ve also got the tour guides but some of the locals do tend to panic when the Kaiju come knocking. Never a good move since these monsters are as fast as they are large. So as you can see I definitely had no problem with the characters. It was a fun enough bunch even if none of them are all that memorable. Now we get to the Kaiju. They were all pretty solid. The best one would probably be the main one. That squid packed a punch and was even able to move on land. 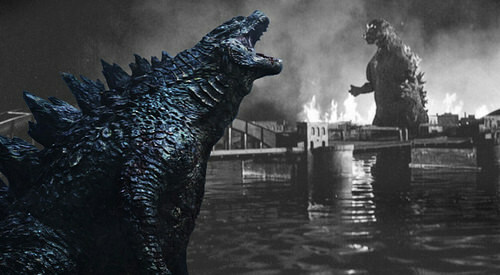 I definitely was glad to see him pop up and his scenes were certainly the closest to something out of a Godzilla movie. Then we have the big turtle that was neat. While the ability to stretch out your head isn’t very useful or practical, it was visually interesting so I’ll give it some props there. The monsters were definitely fun so this title earned its creature feature status. As I mentioned, the film does slow down a bit during the second half though. That’s because the humans start to take up a bit more of a focus at that point so the monsters are secondary. I can tell you now that this is never a good idea since we are all here for the Kaiju of course. The humans are just the added bonus. It never gets boring or anything like that though. I also think the monsters should have maybe been a bit stronger as well since one of them was getting absolutely wrecked by the humans and their guns. If you’re not bullet proof but are huge like these monsters then you’re just going to end up being an easy target. I do think Kudo’s boss will likely go down as one of the more underrated characters among the Kaiju community though. I like how he doubted Kudo from the start and never changed his mind from that. After all, why should he? When you think about it, Kudo’s story doesn’t make any sense so sending him off on a wild goose chase makes a lot of sense. He’s a one shot character but is a perfect example of this film’s humor that meshes well with the story. 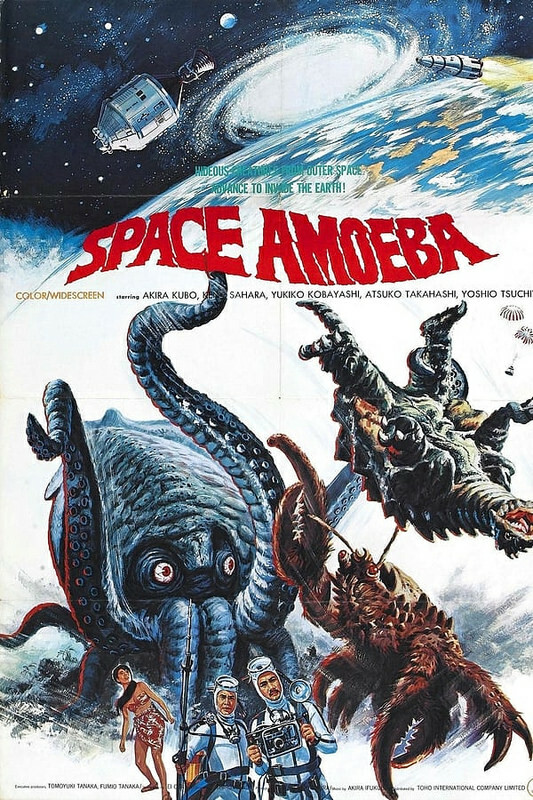 Overall, Space Amoeba is a solid film. It’s definitely a retro Kaiju movie that is worth checking out and you will never look at the giant monsters the same way again. Don’t worry, we’ve also got aliens in the mix which really helps as well since those guys should always be included in such an adventure. Kaiju and Aliens go hand in hand after all. It would be cool to see these monsters go up against Godzilla one day although they would probably be destroyed very quickly. The Amoeba may not be one of the strongest fighters out there, but he’s a fun one. 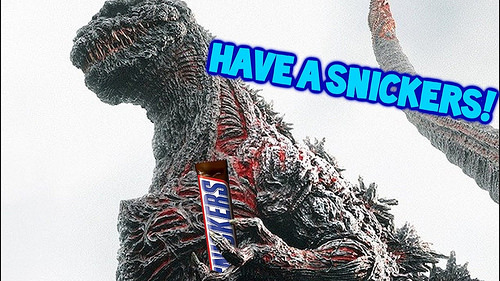 It’s time to look at the new Godzilla film! While the last Netflix installment wasn’t great, it was still a pretty good film. We got to see a reasonable amount of Godzilla screen time and the action scenes were pretty intense. 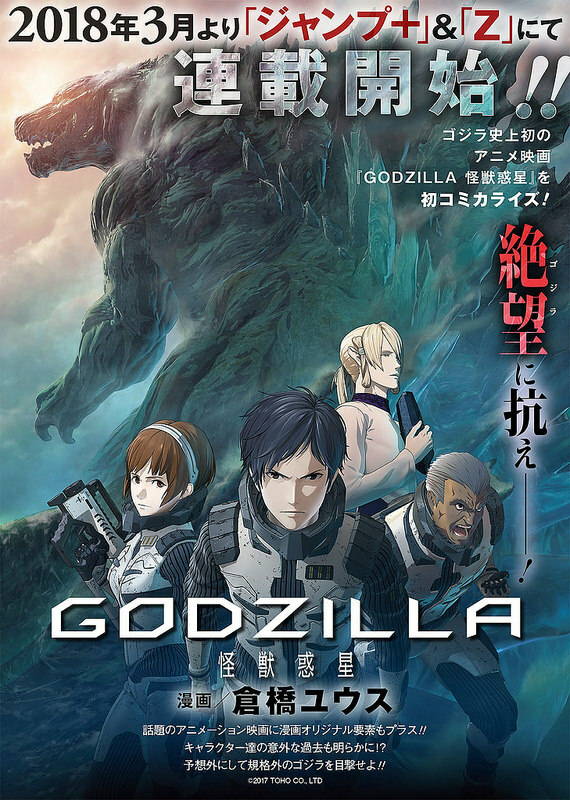 Unfortunately this one is even more focused on the humans to the point where it can barely be called a Godzilla film. This movie is definitely a mess and I blame most of it on the painfully low budget that this movie seems to be tied down with. The film starts with Haruo waking up and realizing that humanity has survived after all as a girl tended to his injuries. The Earthlings have fused with Mothra dna to allow themselves to survive the reign of Godzilla. They also use Mecha Godzilla’s armor to create arrows with which to fight back. The problem is that nobody is able to even damage the King of the Monsters. The heroes decide to use the armored city to fight back but can a city which doesn’t even move hope to win this fight? The sad thing about this film is that most of it would be impossible if this was a different version of Godzilla. A single blast would have done the trick if Godzilla didn’t wait to make a move until days pass by each time. Even when he does finally make a move Godzilla only fires a single shot. Apparently he knows that beams won’t work but in that case he ended up playing himself since we find out that it actually would have been an effective tactic. One blast melted all backup harpoons and various parts of the city. Why would you not fire again? The film can’t seem to decide whether Godzilla is extremely powerful in this version or if he is actually one of the weaker more brittle versions. Either way he didn’t look impressive. He literally walks into every single trap and shows no signs of real intelligence. The film makes him look like a zombie the whole time. The design wouldn’t be bad either if it wasn’t for the lack of animation which makes him appear to be frozen the entire time. Another thing that’s tricky about the film is that you don’t really have anyone to root for. The humans certainly aren’t going to win a vote since they are already pretty divided with a lot of factions that would betray each other at the blink of an eye. One group becomes a little more extreme here which is unfortunate since prior to that they had been reasonable. It’s true that the humans severely overreacted with the whole merging with machine thing when it was voluntary, but that shouldn’t have made everyone go off the deep end. There is also a bit of romance here but it’s so forced for extra drama later on that you won’t get emotional about it. High command doesn’t do much here and they still seem at a loss for answers. They don’t have a choice but to help if you ask me since they are running out of fuel and won’t be able to make it to another planet anyway. Their only chance is Earth so even if it will be tough they should try to make do. It’s not like the world is uninhabitable since the insect people still live and as long as the humans can make more masks they would be okay. Honestly if they weren’t so determined to try and crush Godzilla they probably could have coexisted well enough. It takes him days to wake up from a nap so where is the risk? Just lie low and accept that humans are no longer at the top of the food chain. I didn’t care much for the animation in the first film and that hasn’t changed here. It looks like a cutscene you would see in a 3DS Fire Emblem game. That may work for small scenes but if you’re making a whole movie then surely you have more budget than the cutscene development crew right? Yet, the animators are afraid to do much of anything so most of the film is just characters talking and walking around in circles. There is very rarely any real movement to speak of and that’s just a shame. It’s not a fun film to look at. Most of the movie is also rather silent so prepare to focus on the dialogue I guess. The few scenes with music that we do get are quite solid though so it is just a shame hat it couldn’t have happened more often. It had a good sci-fi beat to it that was very fast paced and made you feel like you were suddenly in an energetic film. As there is one more film in the trilogy we do get an after credits scene. Unfortunately it is also sloppily done and destroys any chance that the scene may have had of actually being really good. The whole thing is recycled footage and several scenes pop up more than once. It was just painfully bad especially since everyone already knew who the name was going to be well before the line since this monster had been rumored/semi confirmed ages ago. The execution just wasn’t there. While there are a lot of negatives to the film lets at least look at some positives before concluding. When we do get music it’s pretty good so that’s solid. I do like the mech suits that the heroes wear. They feel pretty powerful and do move very quickly. They effectively can’t be hit as long as the heroes don’t make any obvious mistakes. The concept of a Mecha Godzilla city is pretty sound even if it’s not as cool as actually having Mecha Godzilla. It may have even been able to win if the heroes weren’t rushing it so much. Did they really need to force a fight with Godzilla right away? Waiting 2-3 days or more would have ensured their victory and I think that would have been worth it. Since they can communicate with the mother ship they could have come up with a plan. Overall, This film was definitely very underwhelming. 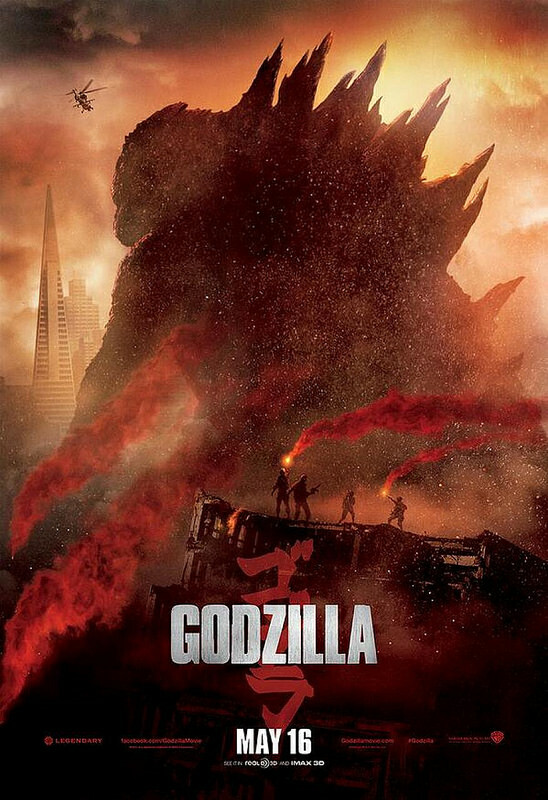 If it wasn’t called a Godzilla film then it would have been a little better but even then I doubt it would have been anything more than average. It technically makes no critical errors like animal violence, fanservice, or anything like that. Yet, the film is just rather boring the whole time and it’s hard to get engaged since the heroes never feel like they have much of a chance. There is no way their plan should have even been close to succeeding if we are being honest. I’d probably advise you to skip this film and watch one of the live action Godzilla films. As a longtime fan I can tell you that this one forgets what a true Godzilla film is. A battle of Kaiju that shakes the planet. That’s why if the directors didn’t want to do this they should have labeled it as a classic sci-fi indie film about overcoming a large monster. It’s just that when you put Godzilla in the title you get a certain set of expectations. I remember watching the first Pacific Rim a while back and enjoying the concept of Kaiju vs Robots. The film had a relatively low budget so you couldn’t see large portions of the fight since it was at night but the whole thing was pretty epic. It was a solid film and I was certainly ready for the sequel. This film looked to increase the action based on the trailers so I was definitely all for that. It’s a solid sequel and one that almost matches the original film. It takes place 10 years after the first film where the heroes closed the rift and saved the world. The world is ready to move on to automated drones so it appears like the pilots are about to be phased out. Are drones really a practical alternative though? They seem to turn evil in every sci-fi film. Meanwhile, we have our new main character. His Dad may have been leading the charge against the enemy but this guy just wants to have a bunch of parties and stay out of the action. Unfortunately he attempts to follow a thief so that he can steal the stolen items but he is apprehended by the cops and forced back into the program. A dark Jaeger appears at the summit he is supposed to protect and this begins the most climactic fight of his life. Can our heroes save the world one last time? The action definitely lived up to the marketing which is nice. All of the fights take place during the day so there are no shortcuts like having most to obscure the robots. The two battles between Gypsy Avenger and the evil robot are excellent. Even if Gypsy does seem outmatched when it comes to the mechs, the humans know actual hand to hand combat which is finally important. After all, you would expect that to give you a big advantage in a fight right? Martial arts amp up your normal attacks so why it when inside a mech suit? The climax battle is great as well with the 4 Jaegers against the 3 Kaiju. Admittedly the Kaiju don’t look nearly as impressive as in the first film and only one of them appears to be able to fight back. Still, they do get to roar quite a bit and I can always get behind that. Being able to absorb kinetic energy is always a great ability as well. Either way, the action scenes are definitely the highlight here and remind you of exactly why we needed a new Pacific Rim. I also do find it ironic that the Jaegers seem so much more streamlined and efficient then the Transformers. The Jaegers can still be a little slow at times, but they can maneuver through right windows and have a good array of abilities. They are really only limited by the pilots. Unlike the Transformers they aren’t constantly tripping or falling over. Granted, they can be knocked down rather easily by the Kaiju, but they get right back up. The soundtrack isn’t bad but it isn’t memorable either. It won’t be one of the things that you will be talking about as you exit the theater but the visuals and loud sound effects help to mitigate this. I never count a lack of a soundtrack as a negative that would affect the score either unless it is painfully bad to listen too. Now it’s time to talk about the writing. Well, it’s certainly not great but it isn’t bad either. The dialogue could certainly be a lot worse and while the characters are rather generic they are written reasonably well. It’s definitely still night and day when compared to Transformers. I’d say that the only scene where you will be cringing a lot is when the main character heads to the kitchen to have Ice Cream. He is extremely unhygienic which makes it gross rather than amusing. He eats from the ice cream bowl and puts his hand in the sprinkle jar. I feel bad for anyone else who enjoys the ice cream in this place. Surprisingly there aren’t too many over the top scenes like that which I was definitely glad about. There is a random subplot where one of the cadets is being mean to Amara and that was unnecessary, but not badly handled. If anything, the bully suddenly becoming nicer was rather rushed, but I guess getting beaten and forced into a choke hold by a little kid in front of everyone may have helped to crush her ego a bit. Jake is a decent main character. He’s rather annoying at first as you can’t sympathize with him though. He doesn’t even need to steal or be a crook but just does it for the extra money. The whole currency exchange that he had going seemed rather illogical so maybe he just spent all of his money. Either way, he doesn’t get good until after the first showdown with the enemy. Then he finally wisens up to the fact that he needs to get it in gear and actually start fighting as opposed to constantly complaining and whining. You can probably tell that I’m not a huge fan of the guy so maybe saying that he is a decent character is a mild stretch. He is a lot better in the second half though so that helps to nage the opening at least a bit. Then we have Nate who is Jake’s co-pilot and he is all over the place as well. He gives Jake an incredibly hard time throughout the film, but will also occasionally let it be known that he thinks Jake could be one of the greats. By the end of the film they are old pals again and the tension just seemed rather fake. Of course, I am on Nate’s side here since Jake did apparently abandon him for no good reason and then his next partner also abandoned him so it’s been a tough time for that guy. Amara is essentially the kid from the recent Transformers film except 100x better. Instead of just talking tough and getting in everyone’s way, Amara is actually very capable on her own. She built her own Jaeger which is extremely impressive. I can’t give her enough credit for that because it must have taken a very long time so she was persistent and also had the skills to break into a government restricted area. Yes, you have to suspend your disbelief for a lot of the film, but what else is new? She sort of vanishes for a good chunk of the film, but returns in time to help for the climax. She’s not perfect, but Amara is probably the most reasonable character in the film and maybe will be the one that you can sympathize with the most. While everyone else is playing defense she is preparing for the next battle. Then we have some returning characters from the first film like Newt. His interface with an alien was rather weird and pretty iffy at best, but aside from that one scene he is definitely a strong character. He delivers most of the snappy one liners and really doesn’t care about anyone, but himself. You can’t help but admire his self confidence and the fact that he is always the biggest person in the room. (When it comes to ego anyway) He’s an exaggerated character, but in a good way and his humor tends to land a lot more than the other characters. There is also Hermann who is basically the more stoic boring counterpart who uses his tech to help the world. He’s cool and all I guess, but you just can’t picture him putting up much of a fight compared to Newt. Then we also have Liwen who is the head of corporate and feels like an antagonist in this film because of her ideals. She wants to use her drones to make the world a safer place where pilots aren’t constantly dying. They are now safe away from the dangers. It mirrors the real world issues of drones as they are safer for the pilots, but also bring with them a ton of security risks like the fact that they can be hacked or malfunctioned. They aren’t a complete substitute for normal Jaegers and Liwen tries to make this point, but the other characters basically just yell at her the whole time to drown out her points. Yes, I’m on Liwen’s side here. Apparently in 10 years we were only able to build a small handful of Jaegers to defend the main base and the UN Summit while she built hundreds of them in the same time frame. I think it’s obvious which ones are more efficient and they also seemed fairly strong if you ask me. Again, we do need a blend of both, but if we really want to win a war with the aliens then Liwen is the world’s only chance. Finally, Mako also appears in the film for a bit as a guest star and she’s a cool character as always. Mako’s intelligence is given a lot of credit here as she is able to spot key facts about the enemy in an instant. While her role was small, it was important and she had a more lasting impact than many of the other characters. Does anybody actually remember the names of any of the Cadets? Those guys never got any real development (Which is a good thing if you ask me) and were just around so we could have more Jaegers. Development just wastes time if it’s used on too many characters, but that’s why Mako is good since she already had her character development in the first film and here you got to understand her character in a flash. Maybe a third film could flesh out the other pilots, but again…that’s unnecessary. Lets stick to the fighting. You’ll never get bored during the film because it’s just very exciting. At times the film goes a little too overboard in trying to show how hopeless it is for humanity though. There are some points where it should really be all over for them, but the villains have mercy or don’t make the right moves. When the mini robots came swarming in they could have easily destroyed the Jaegers by going inside the circuits or something like that. It’s always a very annoying strategy by the villains, but it works. Why didn’t the evil Gypsy blast the 3 robot reinforcements who were being carried over? They were sitting ducks while landing so he could blast them or just stab all of their processors. Why did the villain just wait by his lonesome in the arctic for a fair 1 on 1 fight when he could have lured the heroes somewhere else? If he hadn’t been in the arctic then the heroes would have been absolutely lost. Of course, the arctic fight was one of the best scenes in the film. Second only to the first fight so I am glad that the battle happened. I know that the whole point of these films is Robots against Monsters so I should be glad that we still get those at the very end, but honestly that robot fights were the best part. This is why I would love a Gundam film at some point with a proper budget. I don’t know why but Transformers just never has good fight scenes like the Pacific Rim films. Perhaps it is the terrible designs or the fact that most of the Transformer robots just punch each other instead of mixing it up with lasers and cannons, but the fights in Rim are a lot more satisfying. I’m starting to get off topic though. I may give Pacific Rim 1 the slight edge overall, but it is extremely close. The more I think about it, the more the second film may have the slight edge, but it’s been a while since I saw the first movie. Rim 2 isn’t the greatest movie of the year and likely will have a tough time getting the 2nd spot, but I’d wager that it will still end up being one of the better films this year. If not top 5 then certainly top 10. It just doesn’t really make any big mistakes while doing a lot of things right like the action scenes. No animal violence, no excessive violence, the language was a lot more restrained than in other films, etc. It’s just a solid all around movie. Oh yeah, I almost forgot to actually talk about the monsters all that much, but in my defense the film barely shows them either. They’re basically just a footnote in this movie as they exist just to get squashed and beaten up. They don’t seem to have much intelligence compared to the older monsters and aren’t even much of a threat next to dark Gypsy. This will be sad for big Kaiju fans, but at least we have the Godzilla films coming up. The monsters have good designs and the fight is cool so I’ll give them that. 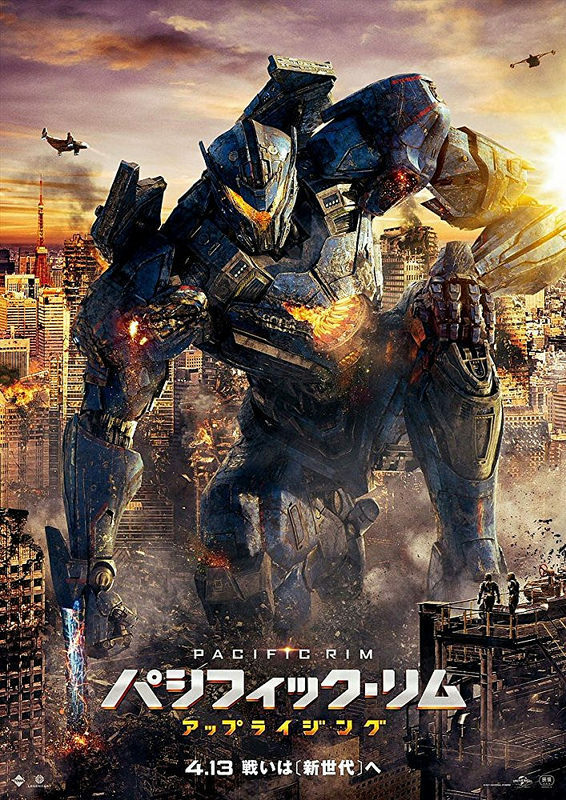 Overall, if you haven’t watched Pacific Rim Uprising yet then I think it is time to fix that. The fight scenes here are very good and are easily the best giant robot fights we have seen in live action. That might be a low bar, but that’s not to say that these fights were not impressive under any criteria. They really did a good job of capturing how well these robots can fight. While they may need more firepower to really tack on the damage to someone like Godzilla, they should be prepared for any monster that the aliens have in store for them. The ending will definitely get you hyped for a possible third film. After all these years it is time for the hype to be realized. 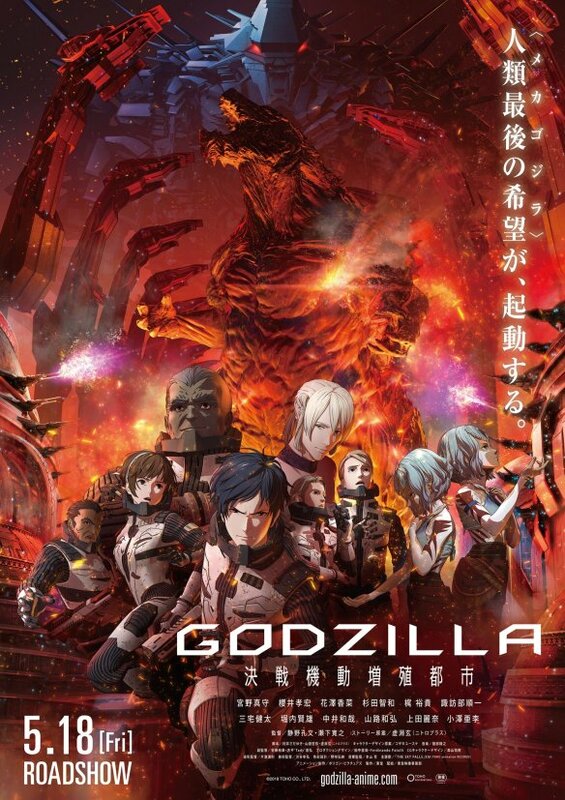 Godzilla is an anime film that seemed to be announced 100 years before it came out. It took so long that you would be forgiven for forgetting it completely. Still, it is here at last so it’s time to compare it to the rest. Was Godzilla’s first anime adventure a success? Well, yes in the sense that it is a good film but not really a success for Godzilla as it doesn’t rank too highly in the franchise. There are some issues here which hold it back. The film starts off with a rebel trying to stop the army from sending a rocket filled with a bunch of old people that are being purged. The airship everyone lives in simply can’t support this many people so some of them need to die. Unfortunately the rebel hesitated because he realized better than anyone that living on a spaceship can be even worse than death. He lets the old people destroy themselves and is arrested. We get a flashback where we see Godzilla and a lot of the classic Kaiju opponents as they decimate the Earth and humanity was forced to retreat off world along with some aliens who were going to conquer Earth but also couldn’t stop Godzilla. Humanity has been looking for an inhabitable planet for around 20 years but nothing would show up so now they are forced to give Earth one more try. Thanks to the ship being slower than molasses they will have to use a teleportation route which will cause 20000 years to pass on Earth. By the way, 20000 isn’t the number they use at first. It’s actually a plot twist as first it’s 1000 years, then 10000, then 20000. I’m honestly not sure why this even qualifies as a twist and why the film didn’t just say 20000 right off the bat but we’ll roll with it. Unfortunately for the humans, it appears that Godzilla still lives and while he destroyed all of the other Kaiju, there are Winged Godzilla spinoffs flying around. Can humanity retake their planet or are they doomed to be destroyed for their arrogance in thinking they could beat Godzilla? There are some aspects of a film that you always want to be on point to complement the writing of the movie. Those two aspects are the animation and the soundtrack. Both are absolutely crucial. For the music, this film is actually pretty good. It’s probably in my top 3 Godzilla soundtracks as I can only think of it losing out to Final Wars and maybe Godzilla vs Mecha Godzilla. It has some nice, fast anime music thrown in there during one of the flying scenes which was pretty cool. That’s basically the stand out music but a lot of it just works pretty well. The true Godzilla theme is also reasonably solid although probably his weakest theme. No, what really hurts the film is the terrible animation. I’m not going to mince words here, the animation is embarrassing. Anime that came out 30 years ago look better. TV shows and online productions with no budget look better than this. This is something that you would expect from an indie film that tries to look really bad on purpose just to defy the mainstream. It’s like watching a Fire Emblem cutscene and stretching it to a whole movie. In a video game you don’t expect the cutscenes to look amazing because you want the bulk of the development time to be spent on the gameplay. If you can do both that’s fine, but the game is the priority. For a movie I am certainly expecting you to put the animation as the priority. Writing doesn’t cost anything so I’m not counting that and while good voice actors are important, they need to be able to work with something. You can almost feel the pain of the animators whenever Godzilla tries to move. You hear his skin cracking as if he is a very fragile Godzilla statue who would break with a single punch. The character model is barely even animated at times and just sits there. The animation can’t even convey Godzilla moving so he just sits there and randomly speeds up off screen so he can get where he is supposed to be. I don’t know where the budget went but it clearly wasn’t with the animation. Godzilla’s energy attacks looked good and in general the energy effects were on point, that’s the only good thing I can say about the animation. The film is very heavy on dialogue but that does seem to be the norm for many Godzilla films. It’s like the writers think that the people who came to see the film about a giant monster don’t actually want to be watching a film about a giant monster. So the main focus is once again on the humans. It’s definitely not the most interesting cast of characters so prepare to roll your eyes at these guys. The main character is good at least. He wants to bring back human pride since he feels like Godzilla took it away when he blew up Earth and we ran away. He’s not really wrong on that, but of course pride isn’t everything. Sakaki is productive with his time and comes up with a plan so it’s not as if he’s recklessly going into action without one. I think the plan is terrible but I’ll get into that later. Sakaki acts like a captain and overall he does an admirable job of leading the assault. The voice actor does a good job and Sakaki basically spits out every line. He ends every sentence with a violent intensity. The Religious Alien, Metphies definitely seems like an intriguing character. He talks a good game and always tries to be one step ahead of the heroes but he isn’t quite as cool as he tries to be. If the whole film was just part of the plan for him then that’s pretty cool. I guess even if it isn’t nefarious and Metphies is just being misleadingly cryptic he still does a good job with the council. He has more personality than the other guy who wanted to build a Mecha Godzilla but the plans fell through midway. I’m sure he will do more in the next film but his character was basically just his personality of being a tough guy. He didn’t do anything beyond that. Now let’s talk Godzilla. This is easily his worst design but that’s probably the animation’s fault. Maybe it looks better in the concept art. This Godzilla also isn’t very smart since the whole plan that the heroes have is getting Godzilla to walk through the path they’ve set up so they can bury him with rocks long enough to blast him. This Godzilla doesn’t have Omni directional lasers to nullify this tactic and he is also too weak to escape the rocks. Am I really supposed to believe that Godzilla was pinned by mere rocks? I can’t buy into that and Godzilla should have been up right away. Then the humans grabbing onto him should have been knocked away when he rose up. Godzilla having a weak point is pretty random and also takes away quite a lot from Godzilla since apparently without the force field his durability is actually pretty bad. 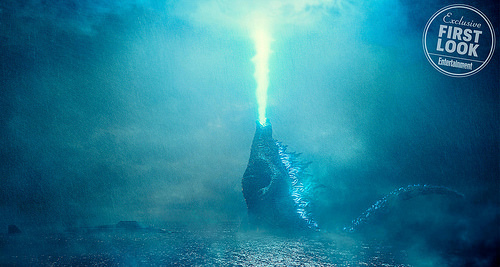 I’m glad they kept in then Atomic Breath and having a force field is cool, but even without all of that this is the King of the Monsters right? (hmmm) There are some twists so I can’t be too specific but we can forgive some of the issues here. Not entirely since the monster should have destroyed the humans and shut down the plan, but it isn’t as bad as it could have been. That’s really my main point here. At the end of the film we get a brief glimpse at what should have been happening the whole time. This is why I think the next film has a good chance at being a lot better. If I just saw this film, I can’t say I would be too impressed with Godzilla to be honest. Even less so with the Rodan ripoffs. They aren’t bullet proof? Really? I just don’t know about that to be honest, seems like a mistake if you ask me. It takes away from them being a threat and it also means that if they give Godzilla any kind of a fight then it weakens the King of the Kaiju as well. It’s a lose-lose situation here. Hopefully the other Kaiju we meet up with are a lot stronger. In theory there should be a bunch of beasts wandering the planet since Earth is pretty huge. I’m guessing their scanners haven’t quite picked up on everything just yet. The film goes by pretty quick but the length isn’t very long to start with. One thing I have to note is that this movie probably wouldn’t be great for rewatching. Sure, the planning is fun and all the first time, but the second time you’ll just want the film to get on with it. It’s something that’s fairly unavoidable depending how you set up a film. Slow burners will rarely be as good as the initial time you watch it while action blockbusters can be timeless if there is always something happening. So, this film would probably lose a star the next time you watch it and probably settle at that score, if not one lower. I personally can’t picture myself rewatching this one anytime soon. 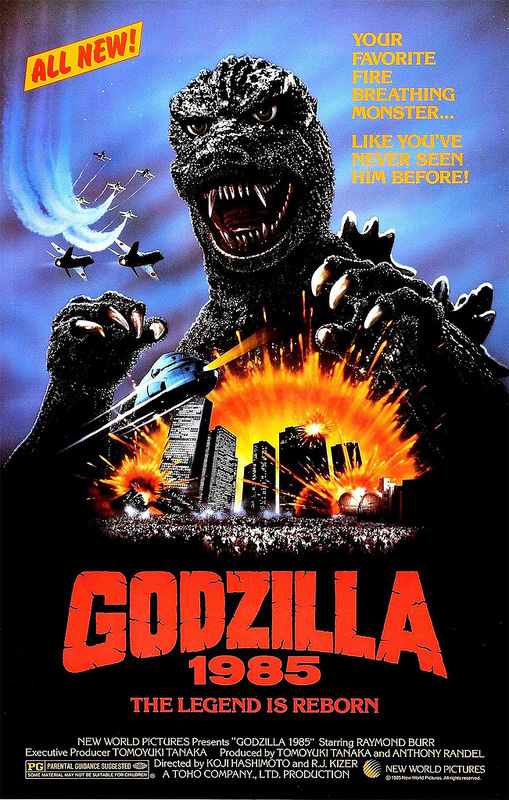 For that I could take a look at one of the older Godzilla films and give it a retro review. 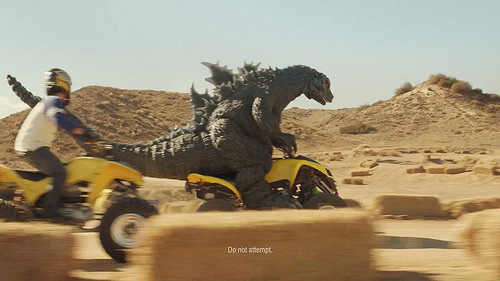 While not a flattering way to secure a high score, Godzilla manages not to make any real mistakes. We don’t have to deal with animal violence, excessive language, random violence, or any slew of negatives that can pop up in a film. My complaints that I listed above are ones that are worth noting but don’t really affect the score much. Combined those issues may just take it down 1 star. It does depend on how you look at it, but basically a film that doesn’t make any real mistakes can get a 7. A 7 means that you’re a fun/good movie. To get higher than that, you have to actually do something really great. To get lower than a 7, you have to make a mistake. A 7 is essentially the starting point for all films. As the credits are rolling it starts out at a 7 and then moves up or down based on what it does. This film doesn’t really do anything and so it manages to stay there. That’s not really a bad thing, it’s just how it is. I can at least watch the full Godzilla film without rolling my eyes or cringing at a poorly made scene. Well, some scenes are poorly made, but at least not in bad taste. I was reasonably interested the whole time. Perhaps not excited, but I was following the story. Overall, If you’re watching this Godzilla film for Godzilla then you will probably be disappointed. If you are watching it as more of a survival film then you’ll like it a lot more. I hesitate to call it a thriller since a good chunk of the film is just everyone talking but once they land on the planet I would say it qualifies. 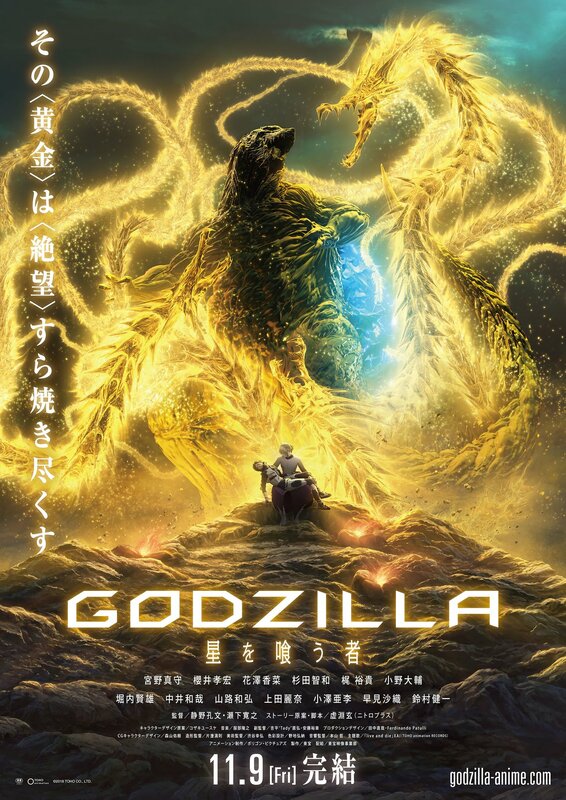 The film would probably be more impressive if it wasn’t called Godzilla which is a little unfortunate since having a brand should usually just make everything better. I do think that Part 2 should pick up quite a bit since most of the characters are already on Earth. Ideally it will focus on them and not too much on the people who are still in space. At least the wait until the next film shouldn’t be too long. This was my long roundabout way of saying that I’d recommend checking this film out.